Just the style I wanted! This loveseat, or settee, is perfect for my small living room. It is the style I favor - old French country - and looks just right! The seat cushion is not the most comfortable but a stiff board under it will do the trick. I will also resize the pillows to be smaller. December 05, 2017 by Darlene M.
My whole house is neutral and tones of linens and creams. This small settee is used in between two larger couches where I have another linen colored coffee table. It's almost the exact shade I couldn't have planned it better. I did get a fabric swatch beforehand, though it is nicer than the picture looks! September 16, 2017 by Dorothy S.
July 23, 2014 by Eve B.
I love my settee!!!! It's high quality and looks beautiful!! I highly recommend shopping with Kathy Kuo Home. I ordered several pieces and artwork too, and everything has exceeded my expectations!! September 04, 2013 by sara b. This wonderful two person settee is hand crafted of sturdy oak in a slightly distressed finish. 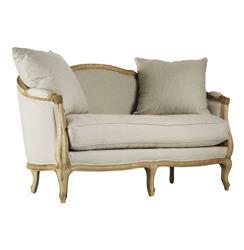 Upholstered in natural linen, this traditional French Country inspired settee lends vintage elegance to any living room. Two 24" linen toss pillow also comes with this settee. Coordinating armchair and sofa available as well.